Just picture your family’s faces if they awoke this weekend to find hot-from-the-oven, homemade cinnamon rolls waiting for them at the breakfast table. They’d be amazed and you’d be their hero. Nice dream, you think to yourself, but who among us could pull off such a culinary feat? After all, cinnamon rolls start with a yeast dough and need hours of rising time. To make the rolls and have them on the table by breakfast, you’d have to start at 3 a.m., right? Prep and cook time: About 40 minutes, plus 2 hours for the first rising and overnight for the second. 1. In a small pan, combine milk, the 3/4 cup granulated sugar, the 1/2 cup butter, and salt over medium heat. Heat, stirring occasionally, until mixture is warm (about 110°F/43°C); butter does not have to melt completely. 2. Meanwhile, place 1/2 cup warm (110°F/43°C) water in the large bowl of an electric mixer. Sprinkle yeast over the water and let stand until yeast is dissolved, about 5 minutes. With beaters on medium speed, blend in milk mixture and eggs until smooth. 3. Beat in 5 1/2 cups flour, 1 cup at a time, until dough holds together but is still sticky and not too stiff; do not over-beat. Turn dough out onto a floured board and knead with your hands, adding small amounts of flour as necessary, just until dough is smooth and no longer sticky, 2 to 3 minutes. 4. Transfer dough to a greased bowl. Turn dough over to grease it on all sides. Cover bowl with plastic wrap, place in a warm location, and let dough rise until doubled in size, 1 1/2 to 2 hours. 6. With a pastry brush, brush the dough rectangle evenly with 4 tablespoons of the melted butter. Mix together the 1 cup granulated sugar and cinnamon; sprinkle mixture over the dough. Then sprinkle dough evenly with raisins. 7. Starting with one long edge, roll dough up jelly-roll style to enclose filling. Pinch or press outer edge gently against roll to seal. Gently pull and stretch roll out until it is 24 inches (61cm) long. 8. Using a ruler and a sharp knife, score the dough at 2-inch (5cm) intervals, beginning in the middle and working outward. Then cut the roll along the scores with a slightly serrated knife, using a gentle sawing motion. 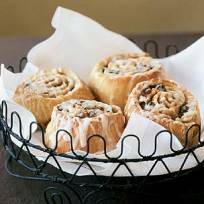 Arrange rolls slightly apart in a well-greased 9 x 13-inch (23 x 33cm) baking pan. Press any raisins that fell out during cutting back into rolls. Brush tops of rolls with remaining tablespoon of butter. 9. Cover pan tightly with plastic wrap and chill rolls overnight (8 to 12 hours). 10. When ready to bake rolls, remove plastic wrap and place pan in a 350° F (180° C) oven. Bake until rolls are well browned and puffy, 40 to 45 minutes. 11. While rolls bake, in a bowl, beat together neufchâtel cheese (or cream cheese) and 2 tablespoons hot water with an electric mixer until smooth. Gradually beat in confectioners' sugar until smooth. When rolls are done (while still hot), turn out onto a cooling rack, then turn them immediately onto a serving plate. Gently cut between them with a knife to separate, then spread icing evenly over rolls. Let cool slightly, then serve.